October 16, 2018  The Augusta-born soul singer's ballads, floor-burners and soaring motivational anthems took the might of Motown's peak and sharpened it to fight the impossible. 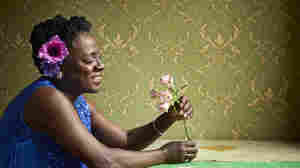 December 19, 2017  Photographer Jacob Blickenstaff documented Sharon Jones for years both on- and off-stage. Here, he shares archival shots of the dearly departed star. October 10, 2017  On Nov. 17, Soul of a Woman wraps up the late soul star's career with 11 new songs — starting with "Matter of Time," a song of infectious hope and optimism. 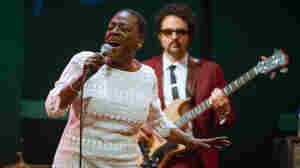 November 18, 2016  Jones, known for generating powerful, energetic performances despite her small stature while fronting The Dap-Kings for the past decade, had been fighting pancreatic cancer since 2013. 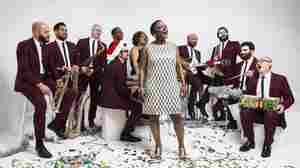 July 28, 2016  In 2013, the energetic lead singer for The Dap-Kings was forced to take a hiatus from the band after she was diagnosed with cancer. 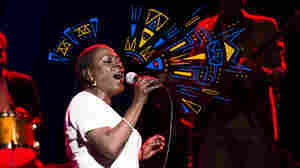 The documentary Miss Sharon Jones! follows her musical comeback. 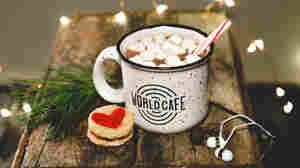 December 13, 2015  The soul singer's new collection of holiday songs seems destined to become a revisited classic. December 25, 2015  Your Christmas celebration is about to get funkier — and, it goes without saying, better. December 21, 2015  The soul star and her Dap-Kings throw a holiday soul party with "Silent Night" and two spirited originals: one for Christmas and one for Hanukkah. 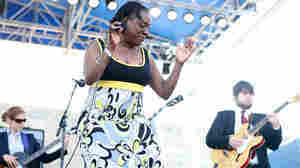 August 1, 2010  One of the most self-assured stage performers in the business, Sharon Jones commands her audience's attention for every second of her hard-hitting concerts. 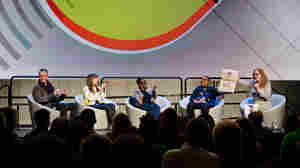 April 30, 2014  Sharon Jones, Pearl Jam's Mike McCready, Meshell Ndegeocello and Hurray For The Riff Raff's Alynda Lee Segarra shared struggles and successes in a joint interview at the EMP Pop Conference in Seattle. January 5, 2014  Less than a year after a terrifying cancer diagnosis, the soul star stages a triumphant return. Set, as always, against The Dap-Kings' characteristically springy horns, Jones growls and struts through 10 timeless songs that couldn't sound better suited to the big stage. 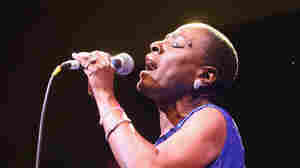 January 12, 2014  When the R&B bandleader fell ill last year, she didn't just stop singing: She stopped listening. NPR's Arun Rath speaks with Jones about returning to the stage and the long-delayed new album Give the People What They Want. 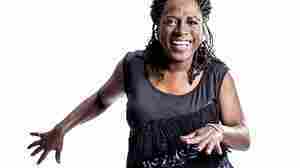 May 7, 2013  Sharon Jones, whose new album, Give the People What They Want, comes out August 6, pours her heart out on a soulful new song, "Retreat." September 2, 2008  Soul may be a full-fledged style of music or just a flavor, but whether you like it straight-up or blended with other music and innovations, there's a sense that soul is always going to be part of the mix. Newcomers Sharon Jones and Eli "Paperboy" Reed share their thoughts. 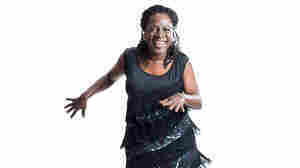 February 12, 2008  Sharon Jones does not hold back. 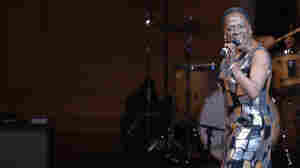 She ranges vocally from smooth, soulful funk to a brazen belt, and she can out-dance almost anyone, having been raised part gospel soul-stirrer, part James Brown disciple. Hear the queen of funk in a high-energy session recorded by KEXP. 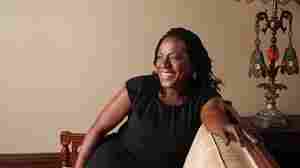 January 10, 2008  Sharon Jones has great talent and a great story. 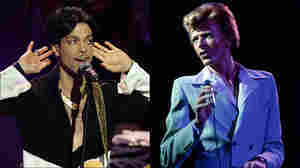 The "queen of funk" has faced music honchos and wildly shifting music trends, but has more than earned her nickname. 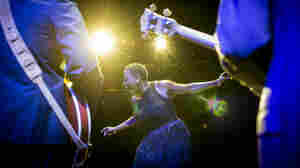 Hear Jones and her band, The Dap-Kings, in an interview and performance from WFUV.